Your home is under constant attack from Mother Nature. Unfortunately, your exterior siding takes the brunt of her wrath including driving rain, freezing temperatures, dry heat, ice and snow. Aside from climate concerns, a host of dirt, grime, and stains can dull the appearance of your siding. 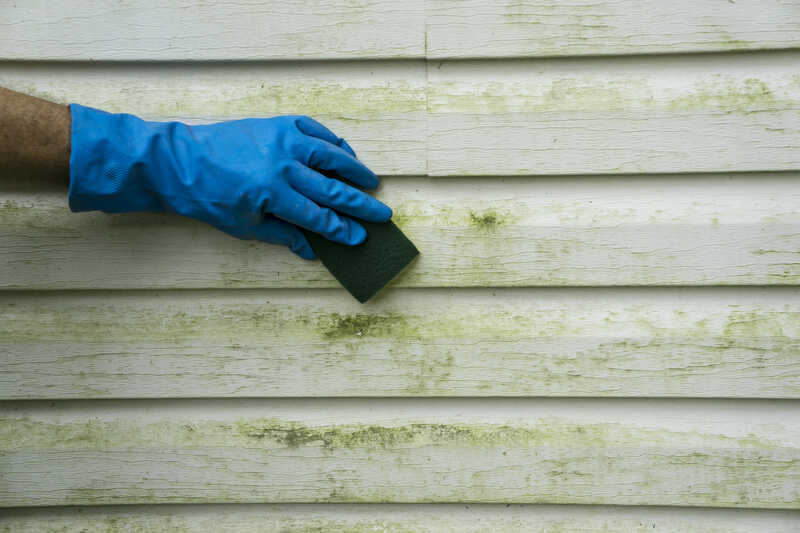 Pollen, spider webs, mold, and mildew are common materials that can dim your siding’s luster. Cleaning and maintaining your siding on a regular basis will help to extend its life and the protection it provides your home. Many types of material are used for siding in the residential construction industry. Vinyl, wood, fiber cement board, stucco, and brick are common siding materials used throughout the United States. Some cleaning methods will apply to more than one siding material and will be noted as such in the applicable section. You can clean vinyl siding easily with a soft cloth, soft bristle brush, extension pole, and mild detergent. A pressure washer makes quick work of cleaning vinyl siding. However, power washers should be set on lower pressures to avoid siding damage or personal injury. In addition, do not aim the stream upward as the water may collect behind the siding, which can lead to rot, mold, and mildew growth. Most pressure washers have a dispense setting that allows you to apply cleaning solutions through the machine at low pressure. Cleaning your wood or fiber cement board siding is an important part of sustaining its appearance projecting the value of your home. The frequency of cleaning and maintenance required for your siding will depend on your home’s geographic location and exposure of the structure. For example, if your house is situated close to a freeway or industrial area, you can expect a heavier dose of dirt and grime on your exterior siding. To maintain the appearance of your wood or fiber cement board siding, it is recommended that you wash the exterior every 6 to 12 months with a garden hose or low-pressure power washer to remove dirt, grime, and debris. Extreme caution is necessary when cleaning these siding materials with a pressure washer to avoid gouging or pitting the material. You can also clean the siding with water and a soft-bristle brush or rag. For heavily soiled or stained areas, a mild detergent and soft brush may be necessary. If your siding has been painted or stained, you should adhere to the cleaning and maintenance procedures recommended by the paint or stain manufacturer. Brick and stucco siding will benefit from an annual cleaning to remove mold, mildew, dirt, grime, and grit. A power washer is the easiest way to clean these siding types. You can rent a power washer from local tool rental centers and complete the job in about a day, of course the time spent largely depends on the size of the structure. It is extremely important that you familiarize yourself with the operating instructions and warnings before using a power washer to prevent injury or property damage. You might consider having your brick or stucco sided home cleaned professionally, for a cost of between $300 and $500 dollars for an averaged-sized home. This might prove to be beneficial for larger or two story structures where ladders and/or scaffolding are necessary. To maintain the protective qualities of your exterior siding, it is paramount that you inspect and re-apply caulking, mortar, and stucco as necessary. This prevents moisture from entering the wall cavity which could cause damage, mold or mildew growth. These areas include nail or fastener penetrations, plank and trim connections, as well as the joints of adjoining siding boards. Repair cracks in exterior siding to prevent water and moisture from penetrating the wall cavity. You should also repair any visible cracks before cleaning or pressure washing. Caulks or sealants should be of a variety that maintains flexibility. Look for the words “permanently flexible” on the label or caulking tube. Keep vegetation away from your siding. Besides providing insects an easy path to your home, they promote mold and mildew growth. Verify that the spray from irrigation systems is directed away from your home. Keep gutters clean. An obstructed gutter will allow dirty water and debris to overflow onto your siding. By performing these cleaning and maintenance techniques, you can extend the beauty and lifespan of your home’s siding.